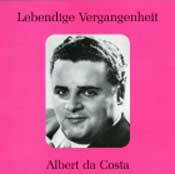 American tenor Albert da Costa (1927-1967) had a respectable if unexceptional career. He studied at Juilliard and began as a baritone and later switching to dramatic tenor roles. He first sang at the Met in 1955 as the sailor in Tristan, and until 1962 appeared in a variety of roles including Siegmund, Radames and Manrico. He then appeared many times in Europe, particularly with the Zurich Opera. In December 1959 he was one of three tenors to sing Tristan to Birgit Nilsson\'s Isolde at the Met (the other two were Ramon Vinay and Karl Liebl). His voice was strong and confident in the upper register and it is surprising that he made only one commercial recording, Beethoven\'s Ninth in 1959 with Bruno Walter conducting. Costa was a reliable singer whose career tragically ended in a car accident in Denmark in November 1967.